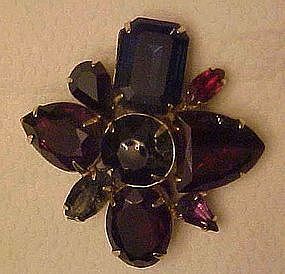 This nice old pin is unmarked but has large assorted colored and shaped rhinestones in deep marine blue, amethyst purples, and ruby red stones. The colors are so deep it is hard to see from the picture. Measures 2" x 2" and has prong set glass rhinestones in a gold tone seting. Back is nice and tight.